Discover Northern B.C. and Alaska Fishing on the water! Our salmon fishing trips run from the beginning of spring until the middle of fall. Please contact us for more information about our great trips and come discover the best salmon fishing out of Prince Rupert on the coast of Northern BC and southern Alaska. We can help you plan the fishing vacation of a lifetime you’ll never forget! Take time out to enjoy a great salmon fishing excursion. We travel from Prince Rupert up to 40 miles north along the coast of Northen BC toward southern Alaska, on the Pacific Ocean. The scenery is unforgetably beautiful and unspoiled. On the first day we like to depart early in the morning enabling us to be at the fishing “hot spot” to catch the first bite. We anchor in the evenings in a secluded bay. Anchoring out has many advantages. One is increasing the number of angling hours in a day compared to wasting fishing time running back to town and opens opportunity to fish during the late afternoon and evening bite. The next morning we are up early so we that we do not miss the early morning bite which on some days are the best bites. While angling for your fish there is a very real possibility of viewing killer whales, gray whales, dolphin and seals. You almost always get to watch the mighty bald-headed eagle in action. 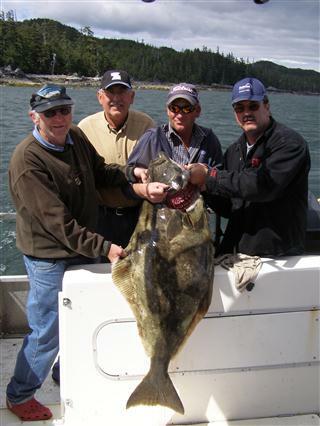 The captain, Gord Judzentis, has been a charter guide for 30 plus years and is DOT certified. 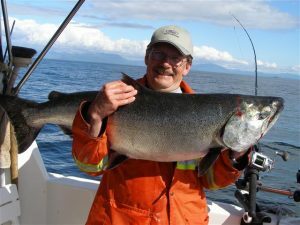 He has extensive knowledge of the waters and knows where the fish are hanging out thus bringing you lots of opportunity to limit out in salmon and halibut as well as ling cod and red snapper. 99% of our clientele limit out. We have no fear of offering a “No Fish, No Pay” policy. Should you get “skunked” the trip is on us! Our charters include the captain, fuel, ice, bait, tackle, down-riggers, rods and reels. You are responsible for a salt water fishing license dated the day of your charter. You need to bring 2 large coolers to take home your fish. Styrofoam coolers are available if necessary. You need a change of clothes, rain gear and camera but remember to pack light. You are responsible for your food and your choice of beverage. I will supply the basics such as salt & pepper, coffee, sugar. The only other thing you are responsible for is having the time of your life! A deposit of 50% of the fishing package cost is required to confirm space on these packages. Full payment is due upon arrival and prior to departure. Deposits and payments are non-refundable unless a replacement booking is secured. If due to weather or other uncontrollable reasons you would have to spend additional nights, you would be responsible for your own hotel, lodging and meal costs.